TAG Heuer, the worldwide leader in luxury, high-precision watches and chronographs is excited to announce the launch of the prestigious TAG Heuer Celebrity Club in the Middle East. The exclusive TAG Heuer Celebrity Club is composed of a select group of intelligent, talented and trendy men & women who excel in their respective fields, and see every day as an opportunity to create history. They have used their avant-garde approach along with their strong personality & panache to play by their own rules and redefine class and standards. They are the individuals who never rest and never take “no” for an answer. They have all walked that extra mile to make things happen and take pride in looking at success as a journey and not a destination. The select members of the club are also men and women who capitalize on their success and fame to defend noble causes, working to make this world a better place. impeccable taste recently was judged by Esquire Middle East as one of the best dressed gentlemen in the region. 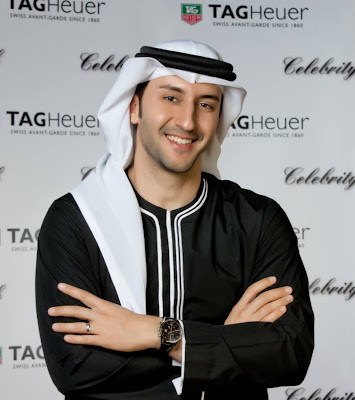 “I am thrilled about the new TAG Heuer Celebrity Club and so proud of its first group of members from the Middle East” said Luc Decroix, General Manager for TAG Heuer in the Middle East. “TAG Heuer has always cherished and saluted individuals who have strong personalities, charisma and mindset. Those individuals are not just survivors, but winners in their own right who have challenged the established and redefined rules to build a future.